The diagram below shows the positioning of the plants in the raised beds and mounded bed in mid-May. Plantings in some of the squares changed later in the summer as the original plants were harvested and new plants were put in their place. The table below provides a summary of the harvest through September 15 by plant variety. A total of 561 individual plants were planted from seed or as a transplant. 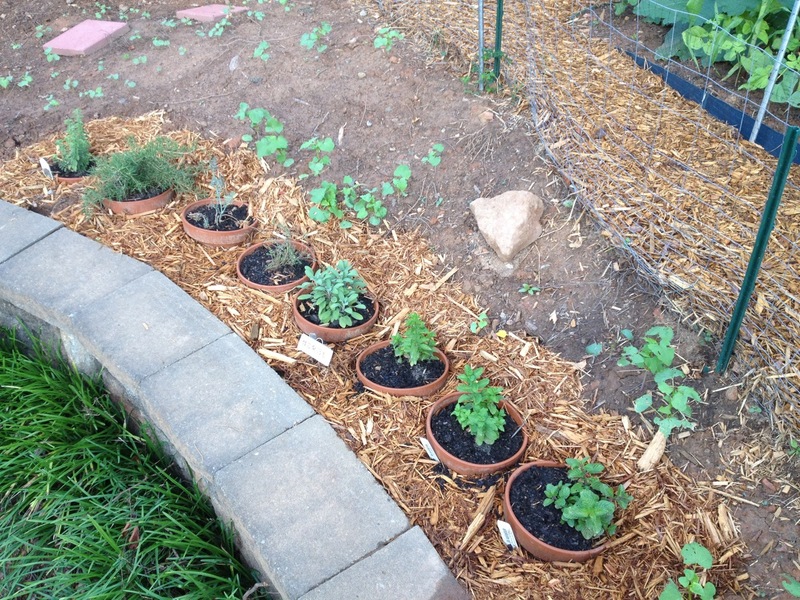 These plants represent 59 varieties of 20 plant types (with herbs grouped together as one plant type). A total of 2842 individual pieces of produce was harvested. Produce damaged or lost to insects, diseases, animals, and other causes were not tracked, nor were produce that were not picked, such as beans that over-ripened or dried on the plant. The Plants column includes plants from seed that did not sprout, survive insect damage, or produce any crop. 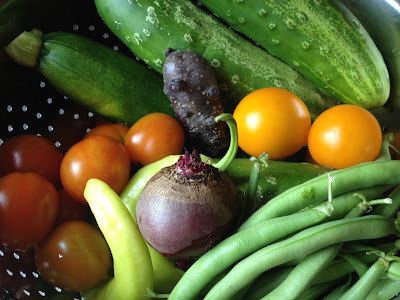 There are still more summer crops to be harvested this year. The tomato plants are still producing. Only a few early potatoes were harvested during the summer and the rest remain in the ground. There are also some onions and carrots that have not been harvested. I have observed and learned more this season than last year because of the larger garden, more variety of plants, new tools and techniques, and a better understanding of what to observe and do. This section summarizes new observations and learnings that can be applied to next year’s spring and summer gardens. 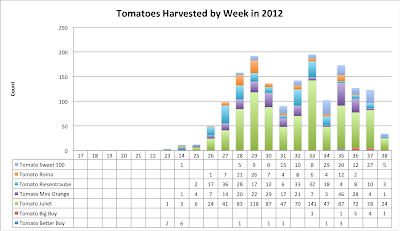 Produce was harvested in 118 of the 140 days (85% of the days) between April 26 and September 13. Harvest counts were made during the washing of the produce right after picking and were later entered into a spreadsheet on a computer. Tracking was done by count rather than by weight. Harvesting of lettuce leaves was not tracked unless the entire plant was harvested, and herb clippings were not tracked. 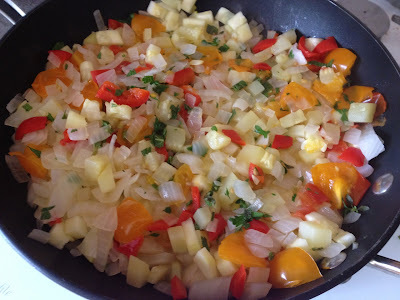 My initial plan included tracking produce that was damaged by insects, disease, animals, and other causes. 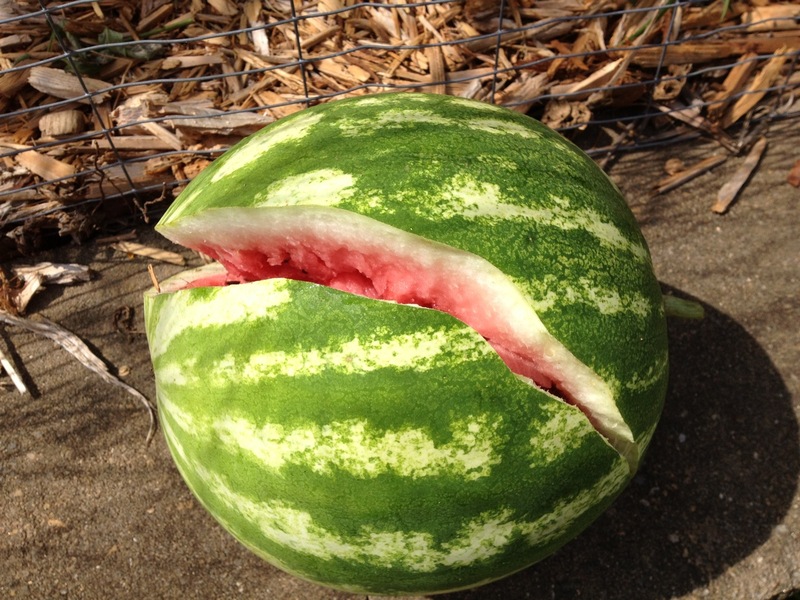 This would give an indication of what percentage of produce is lost to nature. Is it 10% or 50% for a given plant variety? I confirmed early on in the process that while I was interested in knowing the answer, it was going to be tedious and time-consuming. I decided not to track these statistics. 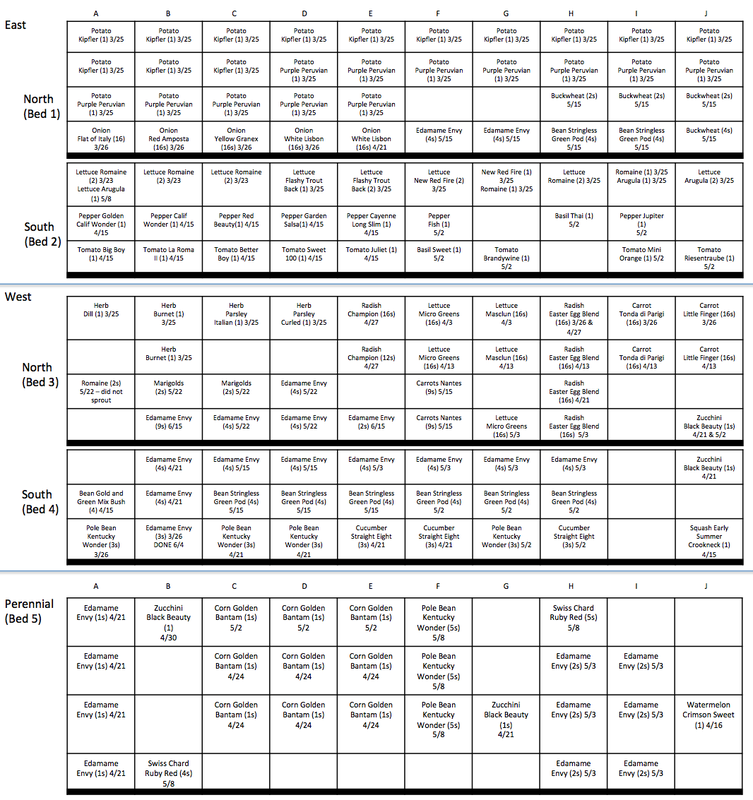 I had also planned to track produce harvested per square in the square foot gardening method. This proved to be difficult for some crops. The vines for pole beans and cucumbers spread in multiple directions and it was often impossible to know which plant and square produced it. 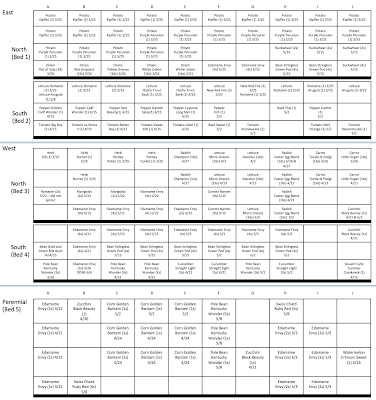 I ended up tracking pole beans and cucumbers by plant variety rather than squares. Tracking takes extra effort. I do find value in the tracking information as it gives facts and history. I plan to continue the tracking of harvests for a few more seasons to gauge progress. There are several wild rabbits in the neighborhood. 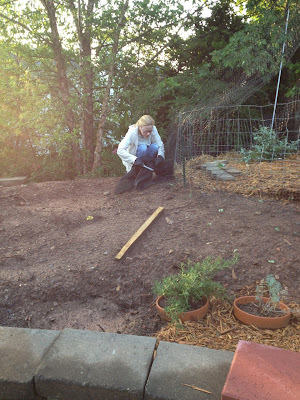 I installed rabbit fencing around the perimeter of the garden soon after the raised beds were installed. I did not bury the fencing as is commonly suggested as I wanted to keep the full height of the fencing above ground. I placed chicken wire on the ground outside of and angled into the fencing as a deterrent to digging underneath. I encountered one baby rabbit in the fenced in garden. 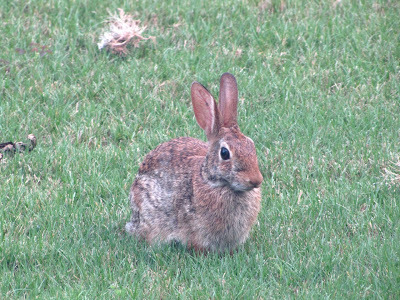 It is possible the rabbit entered the garden when I left the gate open one evening. I saw no damage to any of the plants, including two squares full of harvestable carrots. I flushed the rabbit out from the burnet herbs, cornered him a few times as I unsuccessfully tried to corral and direct him (or her) to the gate opening. The rabbit was finally able to escape underneath the rabbit fencing and in between the chicken wire. Cats and an occasional unleashed dog from the neighborhood visit the backyard. The rabbit fencing has protected the garden from these animals. There are several chipmunks in the neighborhood. There are three chipmunk holes just outside the garden. Chipmunks enjoy tomatoes and can do considerable damage to the fruit. 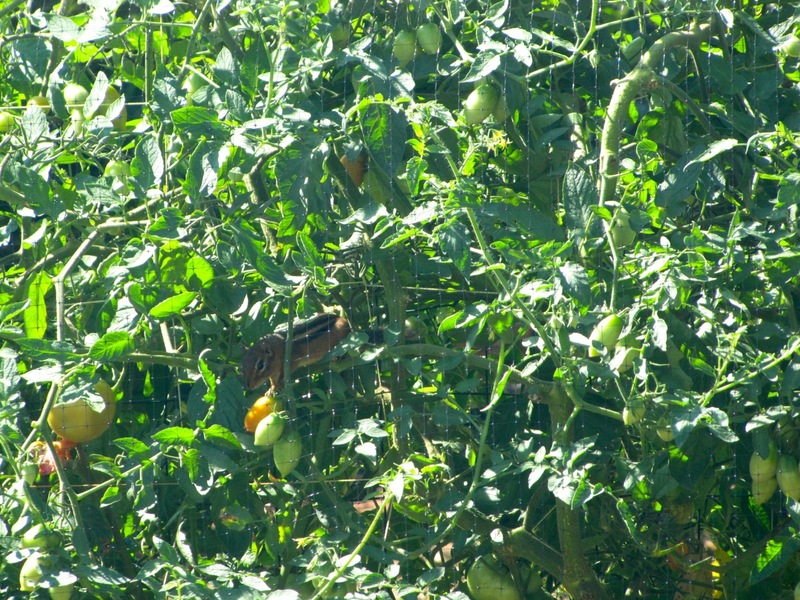 They will climb the branches of a tomato plant to pull down a tomato or eat directly on the vine. The rabbit fencing does not protect against chipmunks. All chipmunks, even adults, can go through the smallest holes in the fencing. I planted buckwheat outside the garden, both to improve the soil and give animals something else to eat. The chipmunks ate the buckwheat seeds and continued to eat tomatoes. 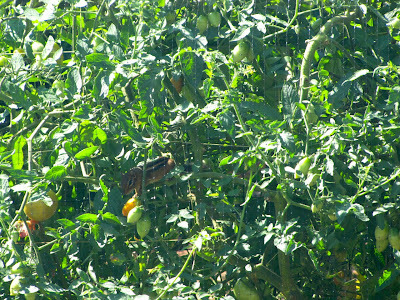 Last year birds damaged strawberries and tomatoes. My original plan was to fully encase the entire new garden with bird netting. I ended up installing bird netting around the entire perimeter of the garden 10 feet high, but I did not put bird netting over the top of the garden. 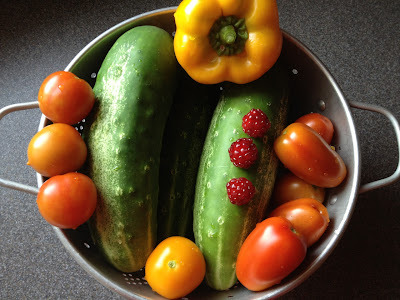 Birds caused damage to tomatoes and the few blueberries and raspberries that grew this summer. Birds can get tangled in the bird netting if the netting is loose or is not fully unraveled. The more a bird struggles to get free once tangled, the more ensnared the bird becomes. Two birds got trapped and the netting had to be cut to free them. Bird netting should be draped and secured all the way to the ground and not just to fencing. Small birds easily hop through the rabbit fencing. Once birds get in the netted garden they will not intuitively know how to get out. They panic when I approach the garden, bounce against the netting several times before finding an escape route. The primary reason I decided not to cover the top was so that birds that happen to get in would be able to find their way out. Some birds are insect eaters. The insect eaters are known to help with the insect population, but they eat beneficial insects, too. I was unable to determine if this benefit more than offsets the damage done to tomatoes and berries by the birds. Some birds eat seeds, including seeds planted into the ground. I used a fabric row cover over newly seeded beds on three occasions until seedlings appeared. I installed the bird netting too close to the pole beans and the tomato plants. The pole bean vines latched on to the netting and grew up and out of reach. Tomato vines grew through the netting. My plan next year is to put bird netting only over the berry plants. Wasps appeared in the garden every day along with bees. I have a newly found appreciation for wasps now that I have an edible garden. Of course, I am still cautious around them and do not want to be stung by them. But I observed how they seem to be on the look out for worms and other insects to eat. 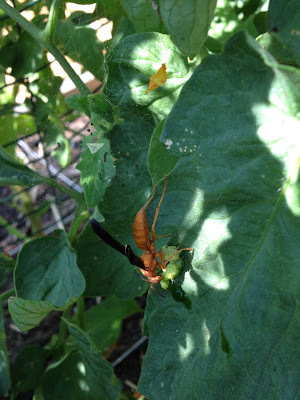 I captured this photo and video of a wasp eating a worm on a tomato leaf. I have two rain barrels hooked together to capture rainwater off one of the downspouts on the house. 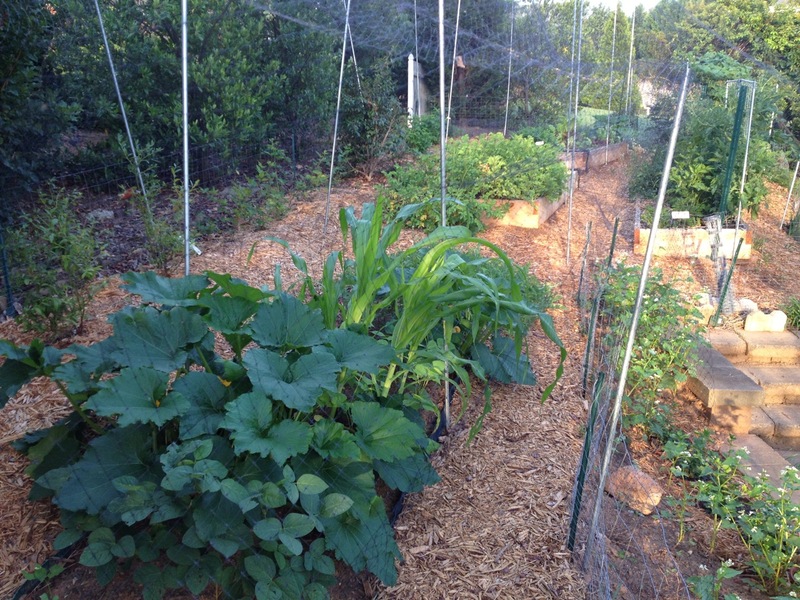 I have drip irrigation on all four beds that are supplied with water from an outside faucet. The rain barrels are at a lower level than the garden and cannot gravity feed the drip irrigation. Hand watering is done using a watering can. A good rainstorm can fill up both barrels (approximately 100 gallons). We had sufficient rain this year to keep the barrels filled. I have been able to hand water the garden from the water captured in the barrels, and I have never completely emptied either barrel. The drip irrigation hoses on the raised beds were used less than 15 days of the year due to rain and sufficient water available in the rain barrels. The first rain barrel was installed with a simple plastic downspout diverter that does not handle overflows when the rain barrel is full. I attached a second rain barrel to catch the overflow, but it also fills up in heavy rain and overflows onto the patio. 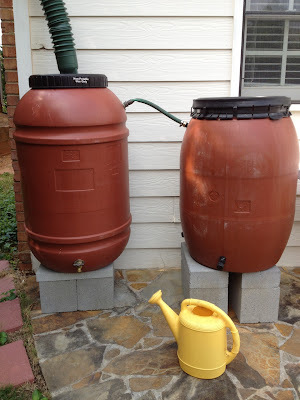 To address my current configuration, I need to drill a hole in the second rain barrel and attach a hose that will divert overflow water away from the home. Fruit and vegetable kitchen scraps, egg shells, damaged produce, and organic matter from the garden are all placed daily in a double-barrel composter. A few grass clippings have also been added during the summer. The first barrel (below) was filled by mid-June. The consistency of the contents in the first barrel as of mid-August is shown in the video below. Not much compost was produced in the first batch prepared in a 50 gallon barrel. The contents of a filled composter will reduce in size as much as a third or more as it decomposes, leaving very little organic matter to use in the garden. The initial batch will thinly cover only one raised bed. It takes at least three months for the organic waste to break down in the heat of the summer. It is not a quick process. Because the composter barrels are above ground there are no earthworms breaking down the organic matter. 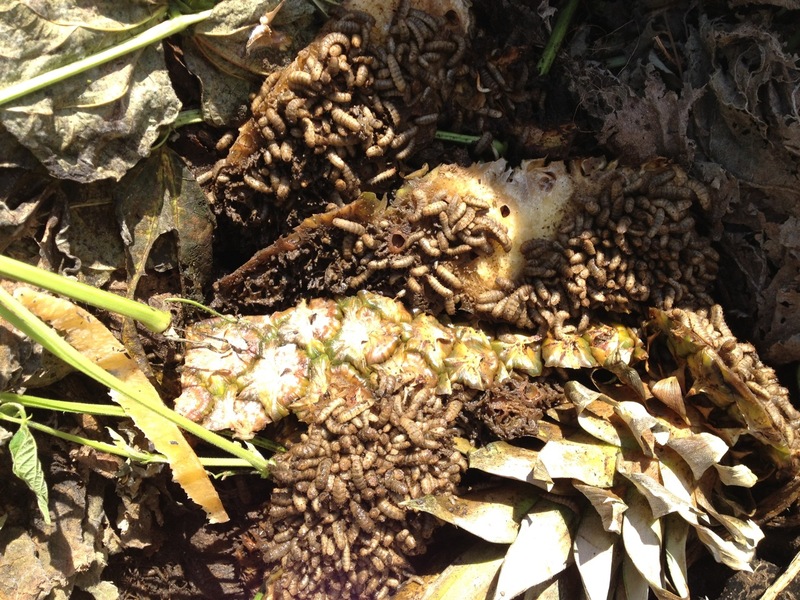 Instead, grubs are decomposing much of the fruit and vegetable matter. There is a concern that the composter does not reach a high enough temperature to kill grubs, insect eggs, weed seeds, molds, and plant diseases. 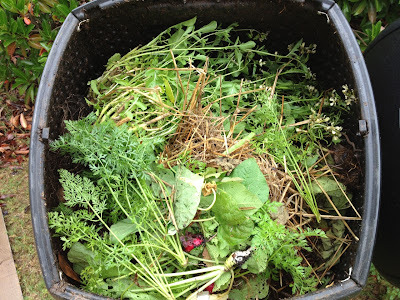 Spreading the compost on the garden could spread these unwanted elements. More research is needed before I use this first batch of compost. 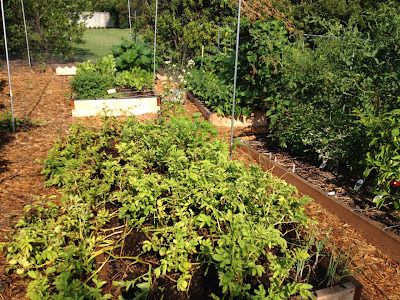 One raised bed was planted with eight tomato plants and seven pepper plants, one plant per square foot. Two basil plants (sweet and thai) were also planted in the same bed. The Juliet plant took over the majority of a 30 square foot bed, crowding out the other tomato plants and the pepper plants. While it is impressive that over 900 tomatoes were harvested from the single Juliet plant, it limited the production of the other tomato plants. The Sweet 100 plant, as an example, was limited to under 140 fruits harvested and most of these were harvested later in the season as the plant had to grow higher up to catch sunlight. Planting tomato plants one square foot from each other is too close. I will plant one tomato plant every two feet away next year. 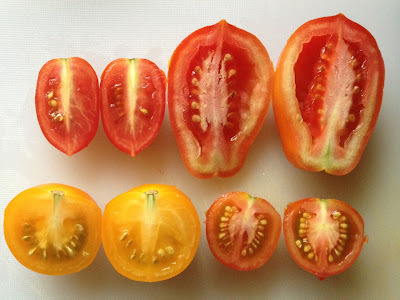 The original plan was to heavily prune the tomato plants to a single stem and to continually prune, removing all suckers (side shoots). First, I may have pruned too aggressively with the Big Boy and Brandywine tomato plants. The Brandywine tomato plant died and the Big Boy did not produce its first ripe tomato until mid-August. Second, pruning is very time-consuming when you have several tomato plants. Third, it appeared at times that pruning would reduce the yield. As a result, after the first month, I contained pruning to mainly insect-infested leaves and crowded areas. The tomato plants overcrowded the pepper plants and blocked the sun. I believe it significantly reduced the yield of peppers. Thai basil was an excellent attractor of bees to the raised bed once it flowered. The sweet basil was shaded by the tomato plants and did not produce well. 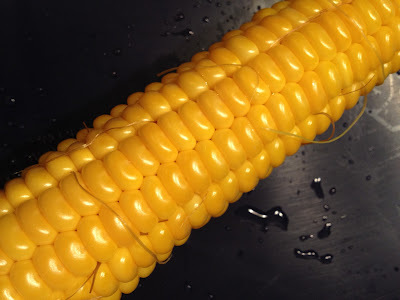 Nine seeds of corn were planted in three rows of three plants each. 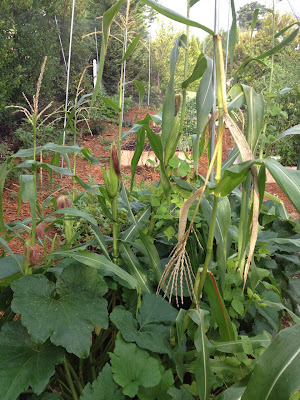 Pole beans and zucchini were planted next to the corn in a technique of companion planting known as "three sisters". 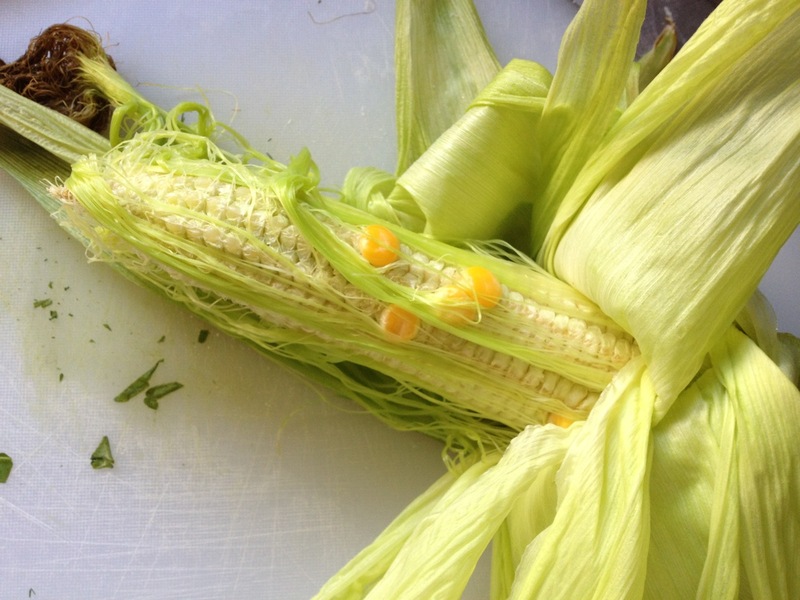 Corn is not pollinated by insects but by wind-blown pollen. As a result, it is best to have several close rows of densely planted corn for natural pollination. Three rows of three plants (nine total) is not sufficient to successfully grow corn without intervention. 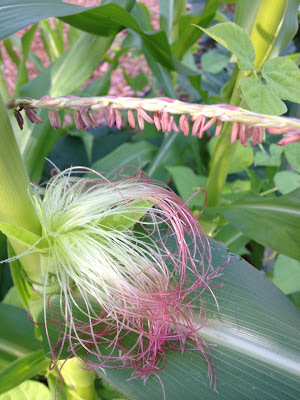 I attempted to pollinate the corn by hand by taking tassels (the flowers with the pollen) and shaking them over the silk. My hand pollination results were mixed. The first hand pollination was successful as I pollinated at the right time of the day (late morning when the flower tassels open and pollen can shake out) at the right time for the plant (with young silk) and on multiple days. My hand pollinations with other corn stalks were less successful as I pollinated at the wrong times and I ran out of tassels containing pollen. The results of a successful pollination and a failed pollination are shown below. The pole beans did climb up the corn stalks as expected. Pole beans are easier to harvest from a trellis than from corn stalks. Some of the cucumbers were very bitter while others were sweet. They were all the same variety from the same seed packet. 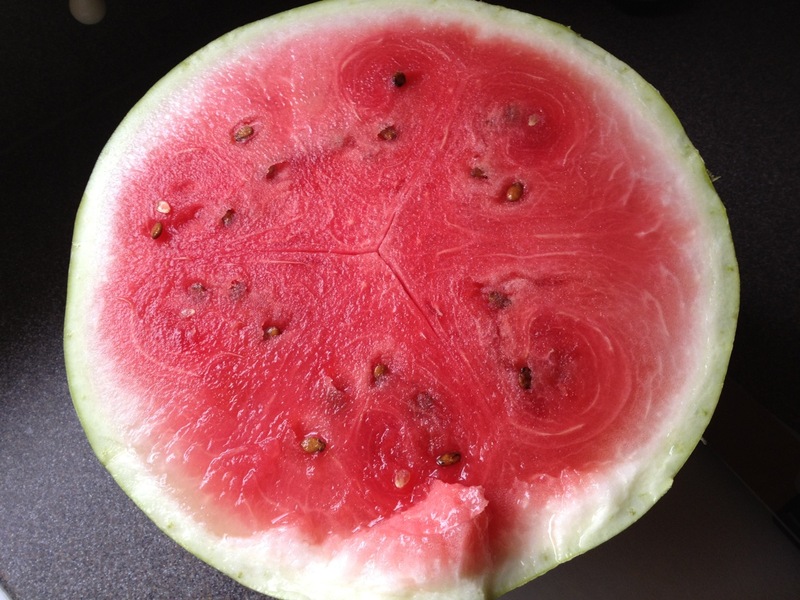 One Crimson Sweet watermelon plant was planted. The plant spread and took over a 5x5 foot area. Four fruits developed. Three cracked open while on the vine. 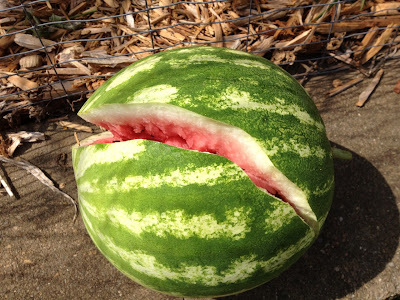 Only one fruit survived. Cantaloupe was planted from seed. The plants flowered but did not fruit. Most of the herbs were planted in clay posts buried into the ground. The pots help contain the roots of the herbs and prevent the herbs from spreading, particularly invasive herbs like mint. Six zucchini plants were planted, five from seed. Only three survived cutworms or squash borers to produce, and they all eventually succumbed to pests. One plant provided 40 (or 67%) of all the zucchini grown. I was fortunate to have planted several this year, otherwise the zucchini harvest would have been small. The new garden is a delight and a significant improvement over last year's garden. My wife and I have enjoyed the "fruit" of our labors every day since our first harvest of lettuce leaves back in late March. We look forward to testing out fall gardening and planning a better spring and summer garden for next year. Wow factor! Only Daniel can do such an amazing presentation due to the fact he experience all first hand! Very impressive. I want to be like you when I grow up!